People associate the South Bronx with gangs, violence, drugs, crime, burned-out buildings, and poverty. This is the message that has been driven into their heads over the years by the media. As Howard Cosell famously said during the 1977 World's Series at Yankee Stadium, "There it is, ladies and gentlemen, the Bronx is burning." In this new book, Naison and Gumbs provide a completely different picture of the South Bronx through interviews with residents who lived here from the 1930s to the 1960s. In the early 1930s, word began to spread among economically secure black families in Harlem that there were spacious apartments for rent in the Morrisania section of the Bronx. Landlords in that community, desperate to fill their rent rolls and avoid foreclosure, began putting up signs in their windows and in advertisements in New York's black newspapers that said, "We rent to select colored families," by which they meant families with a securely employed wage earner and light complexions. Black families who fit these criteria began renting apartments by the score. Thus began a period of about twenty years during which the Bronx served as a borough of hope and unlimited possibilities for upwardly mobile black families. 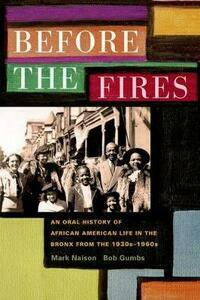 Chronicling a time when African Americans were suspended between the best and worst possibilities of New York City, Before the Fires tells the personal stories of seventeen men and women who lived in the South Bronx before the social and economic decline of the area that began in the late 1960s. Located on a hill hovering over one of the borough's largest industrial districts, Morrisania offered black migrants from Harlem, the South, and the Caribbean an opportunity to raise children in a neighborhood that had better schools, strong churches, better shopping, less crime, and clean air. This culturally rich neighborhood also boasted some of the most vibrant music venues in all of New York City, giving rise to such music titans as Lou Donaldson, Valerie Capers, Herbie Hancock, Eddie Palmieri, Donald Byrd, Elmo Hope, Henry "Red" Allen, Bobby Sanabria, Valerie Simpson, Maxine Sullivan, the Chantels, the Chords, and Jimmy Owens. Alternately analytical and poetic, but all rich in detail, these inspiring interviews describe growing up and living in vibrant black and multiracial Bronx communities whose contours have rarely graced the pages of histories of the Bronx or black New York City. Capturing the excitement of growing up in this stimulating and culturally diverse environment, Before the Fires is filled with the optimism of the period and the heartache of what was shattered in the urban crisis and the burning of the Bronx.